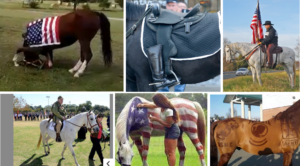 On Veterans Day I came across some fun articles about different ways horse people honor their Veterans. Maybe you can do some of these at your center next year! ~ The backward boot is often seen in parades to honor fallen soldiers, could you integrate it into your program? ~ Every year this man rides downtown just before noon and salutes the Veterans with his horse and flag. You could have your riders salute veteran volunteers, or do an activity with a flag and salute – or even ride your own horses downtown to salute. ~ Decorate your horses! 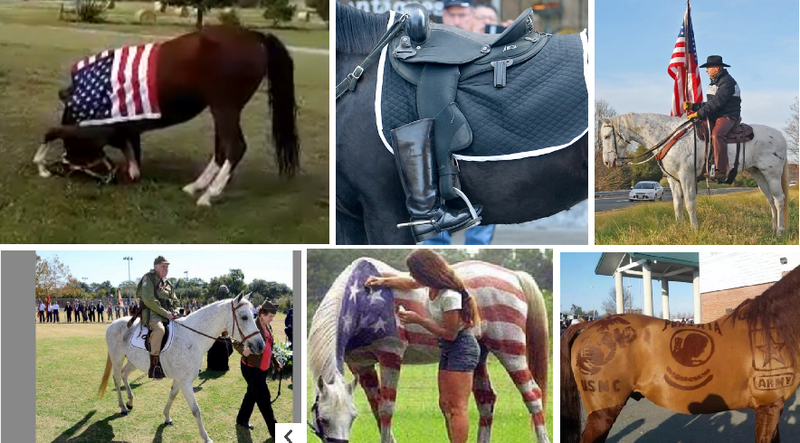 Paint your ponies or deck them with USA flare, dress up your minis, or clip your horse military style! ~ Have a USA themed pancake breakfast – blueberries, strawberries, and whipped cream for red white and blue! Use it to raise money for your Veterans Program. How have you honored Veterans at your center?